The receiver has rejected claims he ignored a local bid to buy the doomed Gaia Centre in north Cornwall. The renewable energy centre, built three years ago, was expected to attract 150,000 paying visitors a year, but had only about a tenth that number. 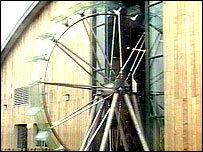 The £5m centre was sold to a property investment company last year which shut the attraction in September. Receiver Andy Beckingham rejected claims by Gaia founders that he ignored a higher bid from a local consortium. Mr Beckingham said: "At the time I was not aware of any other bid at the right price and with the financial back-up to fund the offer." The receiver sold the business to Neovenator, a property investment company based in Surrey last November. Its chief executive Ian McIvor made improvements but could not find a buyer and the centre closed at the end of September. The BBC was unable to contact the leader of the local consortium, Kim Oxenham, who owns the St Enodoc Hotel at Rock in Cornwall. But Jenny Thomson, one of the founders of Gaia, says the consortium's bid topped that and should have been accepted. She said: "I'm appalled. It was a wonderfully good project. "The only reason it did not work was because of the huge borrowing we unexpectedly found ourselves with. "We know that it could be so successful and that the local community support it with all their heart." Neovenator is now marketing the building which can now be used for educational and training purposes and for research and development. It has also changed the name to Campus 21.